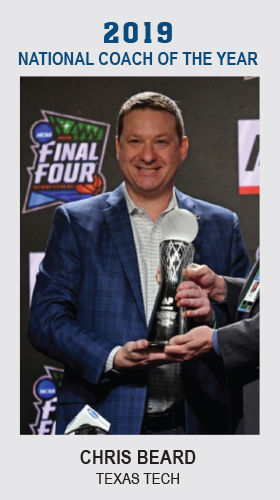 The 2018-19 RTC National Coach of the Year Chris Beard took a circuitous path to becoming the head coach at Texas Tech — and when considering that route, the fact that he guided his Red Raiders to a regular season Big 12 championship and to the Final Four seems too far-fetched to believe. Beard began his high-major coaching career working as an assistant under the legendary Bob Knight at Texas Tech while the Red Raiders were experiencing a period of prolonged success. After subsequent head coach Pat Knight was relieved of his duties at the end of 2011, Beard began a stretch of employment that took him to the ABA, McMurry University, Angelo State and Arkansas-Little Rock. It was while in the state capital of Arkansas during the 2015-16 season that Beard became a rising star in the coaching world. In his lone season at the school, the Trojans stunned #5-seed Purdue in a double-overtime thriller. Following that season, Beard took the UNLV head coaching job in late March, holding it for about three weeks before Memphis hired Tubby Smith from Texas Tech, leaving the Red Raiders job vacant. Beard then spurned his new position with the Runnin’ Rebels and returned to Lubbock to try to finish what he had started a decade prior. After a transition year when the Red Raiders finished a solid 18-14, Beard really got things moving forward during the 2017-18 season. Led by senior guard Keenan Evans and dynamic freshman Zhaire Smith, Texas Tech advanced all the way to the Elite Eight — pushing eventual national champion Villanova for 35 minutes — before the Wildcats ultimately pulled away with the victory. It would have made sense for the Red Raiders to take a step back this season given that Evans had exhausted his eligibility and Smith had left early for the NBA. That was not the case, though, as Beard landed South Dakota transfer Matt Mooney and St. John’s transfer Tariq Owens, while developing sophomores Jarrett Culver and Davide Moretti to take on bigger roles. Those offseason maneuvers paid immediate dividends, as Texas Tech began this season 10-0 and never looked back. Ultimately, Beard’s club ended Kansas’ streak of 14 consecutive regular season Big 12 championships before entering the NCAA Tournament as a #3 seed and steamrolling Northern Kentucky, Buffalo and defending national runner-up Michigan. In Saturday’s Elite Eight, the Red Raiders used their suffocating defense and timely shooting to get past top-seeded Gonzaga and advance to the first Final Four in program history. Texas Tech has a legitimate chance to take home the national title on Monday night in Minneapolis. It might not be the favorite, but Chris Beard has never been the favorite at any point in his career — and that has turned out just fine. 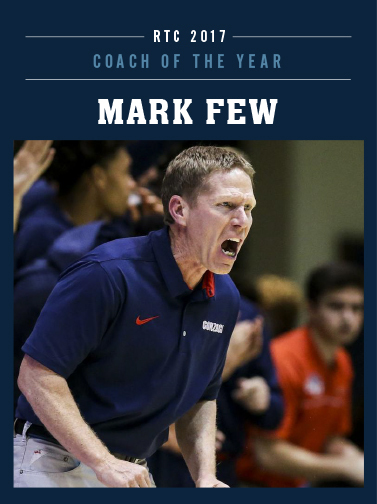 The 2016-17 RTC National Coach of the Year Mark Few is a Gonzaga lifer. He served on Gonzaga’s staff from 1989-99 before taking over the head coaching position after Dan Monson left for the Minnesota job prior to the 1999-2000 season. Few has been wildly successful ever since. He has presided over 16 West Coast Conference championship teams and has led the Bulldogs to the NCAA Tournament in all 18 of his seasons in Spokane. While 36 wins, a #1 seed and a #1 ranking this season are undeniable markers of great success, Few has drawn some criticism over the years for Gonzaga’s relative lack of NCAA Tournament success. Between 2010 and 2014, for example, the Bulldogs failed to make it past the first weekend, losing five straight times in the Round of 32. The most disappointing of those early exits came in 2013 when #1 seed Gonzaga (for the first time in school history) was vanquished by eventual Final Four participant Wichita State. Gonzaga recovered nicely over the next two years, however, advancing to the Elite Eight and Sweet Sixteen, respectively, before this season’s workmanlike run to Glendale. With several new shiny toys on Few’s roster this year — some key transfers and his first-ever McDonald’s All-American — it appears as if Gonzaga is poised to reach unprecedented heights. Gonzaga completed its regular season mission with ease. The Bulldogs entered the NCAA Tournament with a 32-1 record and — just like in 2013 — the top seed in the West Region. The first weekend was far kinder to Few’s squad this time around, though, as Gonzaga coasted into the second weekend with victories over South Dakota State and Northwestern. The Bulldogs had a much more difficult task in facing a relentless West Virginia squad in the Sweet Sixteen. The Mountaineers forced the Zags into their style of basketball — an ugly, brick-filled affair — but Few pulled all the right strings down the stretch to handle the West Virginia pressure, allowing his team to advance to the Elite Eight with a gutsy three-point victory. Gonzaga then easily dispatched a plucky Xavier squad to get the proverbial Final Four monkey off the program’s back. Gonzaga will face a difficult task this weekend in trying to take home the program’s first National Championship. It will first have to beat NCAA Tournament darling South Carolina in Saturday’s semifinal — a team known for a ferocious defensive attack that has made things a nightmare for their opponents. If the Bulldogs can surpass that hurdle, another arduous task awaits on Monday night when they would have to face either Oregon or North Carolina. With Few’s program running on all cylinders and the monkey finally removed, though, it would surprise nobody if Gonzaga becomes the first team from outside the power conference elite to cut down the nets this weekend in Glendale. 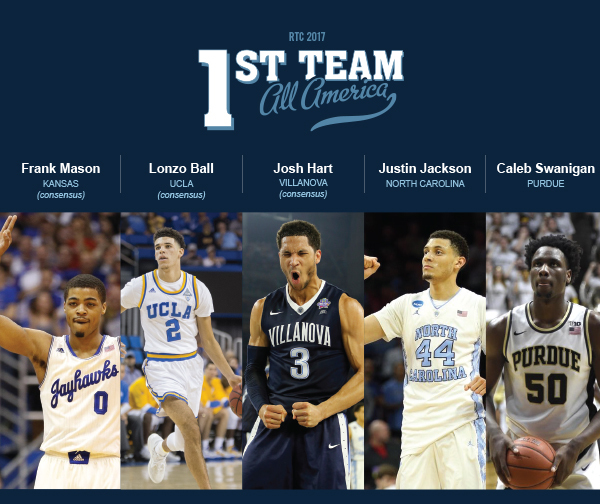 Compiling preseason All-America teams is a difficult task because nobody knows what will come during the upcoming season. There will always be several players who fall short of expectations and there will always be several relatively unknown types who will unexpectedly emerge to stardom. 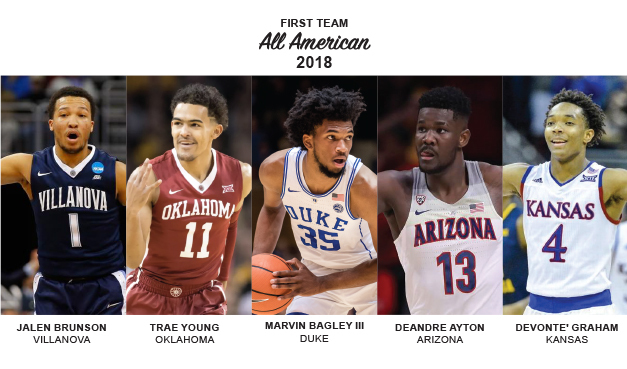 When our outfit of seven RTC pollsters selected their preseason All-America teams in November; nobody could have guessed that only five of the 15 players chosen would live up to their hype; Villanova’s Josh Hart, Oregon’s Dillon Brooks, Iowa State’s Monte’ Morris, Washington’s Markelle Fultz, and Kansas’ Josh Jackson. Hart was the only player projected to be a first-teamer who ended up there. The 10 other players who did not make our postseason team are Duke’s Grayson Allen and Jayson Tatum, California’s Ivan Rabb, Maryland’s Melo Trimble, Wisconsin’s Nigel Hayes, Indiana’s Thomas Bryant, NC State’s Dennis Smith, Xavier’s Edmond Sumner and Trevon Bluiett, and Kentucky’s Bam Adebayo. All turned in varying degrees of productive seasons but were surpassed in achievements by the names that moved ahead of them on our list. Here are the 2016-17 RTC All-America Teams. 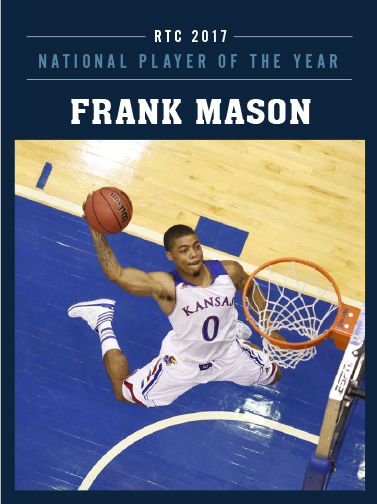 Frank Mason, Senior, Kansas (consensus) (20.9 PPG, 5.2 APG, 49% FG, 47.1% 3FG). After being little more than a complementary contributor during his first three seasons in Lawrence, Mason wrapped up his collegiate career this season in spectacular fashion. What the point guard lack lacks in stature (he is listed at just 5’11”), he made up for it in big time performances. Kansas earned its 13th consecutive Big 12 regular season title and advanced to the Elite Eight this season, and neither of those would have been possible without Mason elevating his game to a superstar level. 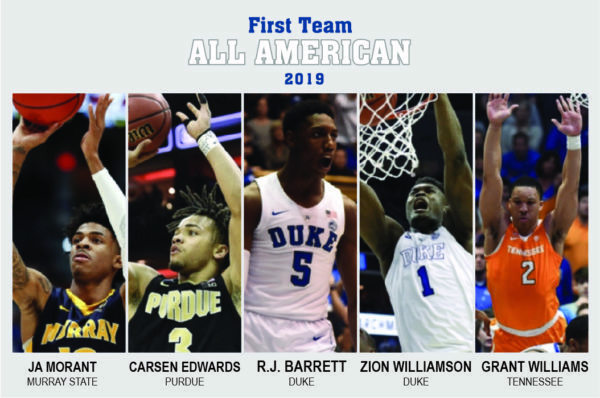 One of the coolest things about college basketball is when a relatively unheralded recruit develops into one of the country’s most accomplished players – and Mason certainly personified that in his senior season. Kansas fields a great team every year, but it is certain the Jayhawks will miss Mason’s services when they hit the hardwood again next fall. Josh Hart, Senior, Villanova (consensus) (18.7 PPG, 6.4 RPG, 51% FG, 40.4% 3FG). Hart starred on last season’s National Championship team, but he took his game to another level during his senior season. The Big East Player of the Year joined Villanova legend Kerry Kittles as the only players in program history to amass 1,800 points, 700 rebounds, 250 assists, and 150 steals. Villanova’s season ended with a surprising Second Round loss to Wisconsin in the NCAA Tournament, but that defeat should not cloud anyone’s perception of Hart’s season, as he was phenomenal from the opening tip of the first game to the final buzzer of the last one. Lonzo Ball, Freshman, UCLA (consensus) (14.6 PPG, 7.6 APG, 6.0 RPG, 55.1% FG). Last year at this time, UCLA was coming off a very disappointing 15-17 season that suggested the 2016-17 campaign would be a make-or-break year for Steve Alford in Westwood. Luckily for the Bruins’ head coach, the arrival of Ball as the gem of a star-studded recruiting class aided significantly in morphing UCLA from a losing team to a Sweet Sixteen squad. A dynamic point guard known for his incredible court vision and ability to make his teammates better, Ball also helped had a knack for making key plays in big games – most notably in a December win at Kentucky and in a February home win over Oregon. Unfortunately for Bruins fans, they will not get to experience more of those star performances, as Ball quickly made his intention to enter the NBA Draft known following UCLA’s Sweet Sixteen loss to Kentucky. Justin Jackson, Junior, North Carolina (18.2 PPG, 4.7 RPG, 2.8 APG). Following North Carolina’s heartbreaking defeat to Villanova in last year’s title game, Jackson chose to test the NBA Draft waters before ultimately returning to Chapel Hill for his junior season. At the time, Jackson stated, “The best choice for my basketball future is to return to school and play for the Tar Heels next season.” His statement turned out to be prophetic, as he became North Carolina’s go-to guy on his way to leading the team in scoring and earning the ACC Player of the Year award. The Tar Heels are a balanced unit with talent littering the roster, but Jackson’s emergence to stardom is the most important reason why Roy Williams’ team has another chance to play for the title this weekend in Phoenix. Caleb Swanigan, Sophomore, Purdue (18.5 PPG, 12.5 RPG, 52.7% FG, 44.7% 3FG). The sophomore big man was a double-double machine for the regular season Big Ten champion — finishing a stellar year with 28 double-doubles and having four games where he grabbed 20 or more rebounds. A big reason for Swanigan’s increased productivity in his sophomore campaign was improved conditioning, as his minutes per game rose from 25.7 to 32.5. He also added a reliable three-point shot to his arsenal, improving his percentage in that are of the game to a robust 44.7 percent. As a result, the Boilermakers advanced to their first Sweet Sixteen since 2010, and that charge was led by a monster season from the All-American. This college basketball season was the “year of the senior.” Seniors like Michigan State’s Denzel Valentine, North Carolina’s Brice Johnson, Indiana’s Yogi Ferrell, Iowa’s Jarrod Uthoff, Kansas’ Perry Ellis, and Iowa State’s Georges Niang were all yesterday named to the RTC All-America Teams. They each put together amazing seasons in lifting their teams to outstanding regular season success and NCAA Tournament berths. As excellent as those players were, however, there was one senior who stood out among the pack. That player is Oklahoma guard Buddy Hield. In this era of the one-and-done superstar, it might be cynical to view a senior winning the National Player of the Year award as something approaching a career achievement award. But while Hield put together a successful first three seasons in Norman, he saved his best for last this year. The dynamic shooting guard averaged an incredible 25.4 points per game while shooting 50.4 percent from the field and a very impressive 46.5 percent from three. In an offense completely centered around Hield’s explosive offensive skills, Oklahoma averaged a robust 80.4 points per game. Hield put together many sensational games this season, but two performances in particular come to mind as the most memorable. In a January 4 epic triple-overtime Big 12 battle between Oklahoma and Kansas, the casual college basketball fan became acquainted with Hield’s heroics. The All-American finished the evening in Allen Fieldhouse with a career-high 46 points on 13-of-23 shooting, along with eight rebounds and seven assists. It was such an amazing effort that Kansas fans gave Hield a standing ovation, and one that will be remembered in Norman and around the college basketball world for years to come. The other memorably outstanding performance came in the Elite Eight when Hield’s star power led the Sooners past #1 seed Oregon and into the program’s first Final Four in 14 years. The senior contributed 37 points on 13-of-20 shooting and 8-of-13 from behind the three-point line. Oklahoma will face a staunch test when it takes on Villanova in the Final Four Saturday night, but it would be unwise to discount the Sooners’ chances of advancing whenever a star like Hield is involved. 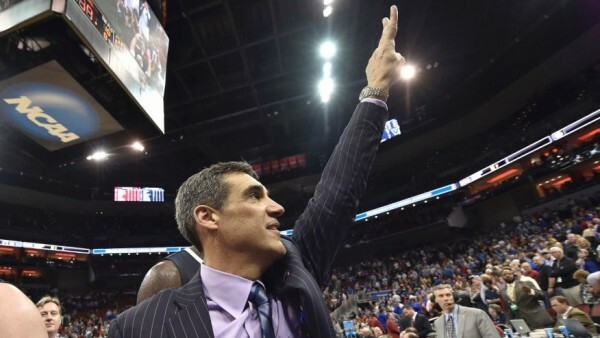 The 2015-16 RTC National Coach of the Year Jay Wright has been a winner throughout his 15-year tenure at Villanova. He has led the Wildcats to 11 of the last 12 NCAA Tournaments and the program has taken home four Big East titles under his guidance. Even with all that winning and a Final Four appearance in 2009, the veteran coach has received some criticism in recent years because of several early NCAA Tournament exits. In 2014, Villanova entered the NCAA Tournament with a 28-4 record and was viewed as a dangerous #2 seed. 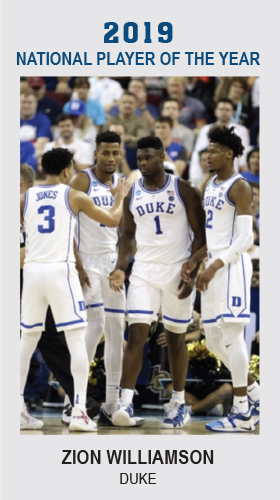 That buzz fizzled out quickly, though, as the Wildcats were sent packing by eventual national champion Connecticut in the Round of 32. The next year it appeared Villanova was in even better shape to make a deep run. Wright’s group compiled a sterling 32-2 regular season that included a 15-game winning streak heading into the NCAAs. That did not matter much, though, as the Wildcats were once again bounced in the Round of 32 — this time at the hands of streaky NC State. With a mostly veteran squad returning this season, Villanova looked once again ready to combine a strong regular season with deep advancement into the NCAA Tournament. Villanova completed its first mission with relative ease, taking home another Big East regular season title and entering the NCAA Tournament with a 29-5 record as a #2 seed. Wright’s Wildcats easily exorcised their first weekend demons two weeks ago in Brooklyn by routing #15 seed UNC-Asheville and #7 seed Iowa. Even with those two impressive wins, pundits still doubted the team’s legitimacy heading into its Sweet Sixteen game with #3 seed Miami (FL). Villanova easily proved those doubters wrong, as it blew the Hurricanes off the floor en route to a 92-69 victory. But even that rousing victory did the Wildcats no favors with their critics. An Elite Eight victory against overall #1 seed Kansas appeared unlikely, but Wright’s veteran squad took the challenge and battled forward to a 64-59 victory. The regional-clinching win sent the Villanova program back to the Final Four for the first time since 2009. 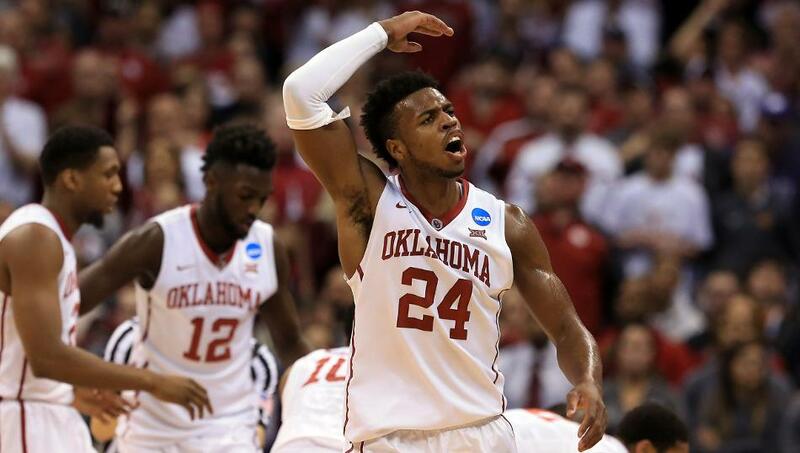 The Wildcats will face a difficult test on Saturday when it faces Oklahoma and NPOY candidate Buddy Hield. The Oklahoma guard is a dynamic scorer with a proven ability to take over a game every time he takes the floor. Villanova is going to have to play a sound defensive game to contain Hield and emerge with the victory. Luckily for Villanova fans, Wright has shown a steady touch with this group all season long and you better believe it will be ready for the challenge. Our RTC National Coach of the Year will know what buttons to push and put his team in a position to win if it executes reasonably well. It is only the latest version of what he has been doing since he began patrolling the sideline at Villanova all those many years ago.